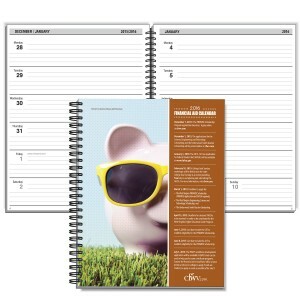 8.5″ x 11″ Monthly Planner with a Leatherette Cover or high impact full color paper cover; Wire-O Binding; January thru December, 1 Month per spread/6 Rotating Months at a Glance. Additional 6 Year Calendar and Future Planning at a Glance. 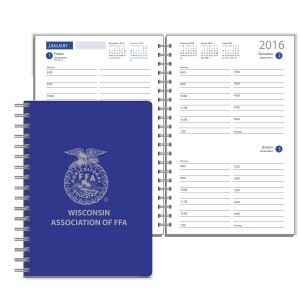 6″ x 9″ Daily Planner with a Leatherette Cover & Wire-O Binding; January thru December, 2 Days per spread/3 Days per Weekend. Personal Information, Important Dates, 3 Year Reference Calendar. 8.5″ x 11″ Weekly Planner with a Leatherette Cover or high impact full color paper cover; Wire-O Binding; January thru December, 1 Week per Page. Additional 4 Year Calendar and 2 Year Future Planning at a Glance. 3 1/5″ x 6 1/4″ 14 Month Planner with a Paper Cover & Stapled Binding; January thru December, 1 Month per spread/6 Rotating Months at a Glance. Additional 3 Year Calendar and Future Planning at a Glance. 6″ x 9″ Weekly Planner with a Leatherette Cover & Stapled Binding; December thru January, 1 Month per spread/6 Rotating Months at a Glance. Additional 6 Year Calendar and Future Planning at a Glance. 8.5″ x 11″ Monthly Planner with a Leatherette Cover & Stapled Binding; January thru December, 1 Month per spread/6 Rotating Months at a Glance. Additional 6 Year Calendar and Future Planning at a Glance.